New Birmingham City boss Gary Rowett inspired his team to a draw in his first game in charge as their derby at Wolves ended goalless. Just a week on from losing 8-0 at home to Bournemouth in a club record home defeat, Blues kept only their second clean sheet of the season. Wolves sub Dave Edwards' left-foot chip clipped the top of the bar. Blues' best chance fell to Jonathan Grounds, whose header was parried by Wolves keeper Carl Ikeme. Grounds was also the man involved in a penalty shout when James Henry's cross struck his outstretched left arm. It was the first time Wolves had failed to score in front of their own fans since their last local derby - the goalless draw against Shrewsbury Town in March. Blues' only previous clean sheet this season was the 1-0 win over Brighton in August - their only home victory. 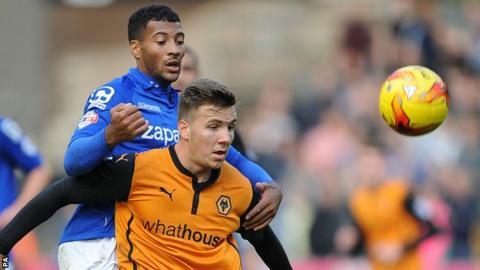 Wolves' point from the lunchtime derby was enough to take them briefly to the top of the Championship for the first time this season, before dropping down to fourth later in the day. Rowett, a former Birmingham defender, left his job at Burton to join Blues on Monday, two days after the thrashing by Bournemouth and a week after Lee Clark's departure. And the new man made changes to his side, drafting in loan signing Michael Morrison, signed from Charlton Athletic on Friday, while Andrew Shinnie was recalled alongside Wolves old boy David Davis. After an early onslaught from the home team, it all worked for the new-look line-up before the break as Wolves quickly ran out of ideas. Blues, by contrast, visibly grew in confidence, creating two chances for youngster Koby Arthur and another for Clayton Donaldson. The second half proved more lively, both sets of fans becoming animated following the handball shout against Grounds. After Ikeme had saved a header from the Blues left-back, Wolves began to create chances following the arrival of substitutes Edwards and Bakary Sako. "It's the first step on a long road, but Gary Rowett's Birmingham were sure-footed for the most part in securing a worthy point. They demonstrated all the qualities of organisation and discipline associated with their new manager, and deserved reward for their efforts, even though Wolves gathered momentum in the second half. "For Wolves, as soon as the teamsheet arrived, the writing was on the wall, and it was in French. Without Bakary Sako and Nouha Dicko from the start, they set a plodding pace, although it was raised by the introduction of Sako and Dave Edwards in the second half. The league table shows there's by no means cause for concern, but it's a measure of Wolves' ambition that they went top and were still disappointed." Kevin McDonald rifled a low shot just wide, before Edwards was twice denied by keeper Darren Randolph. Sako's low cross was then somehow allowed to pass across the face of goal, just inches away from Leon Clarke, who also saw a near-post header fly just over. But, although the dangerous Edwards then saw his chip hit the bar, that was as close as Wolves got to forcing a winner. "We huffed and puffed and we had a lot of the ball but we didn't do enough going forward in the final third. "It didn't surprise me the way they set up, playing 5-4-1. But it was down to us to break them down. "As for the penalty shout, sometimes you get them, sometimes you don't. It could have gone either way." "It's been a fresh start this week. Last week's result really wasn't mentioned. It's all been about looking forward and I'm very pleased with what I saw. "I didn't expect us to come and keep a clean sheet at Molineux. But I'd certainly have taken that. It's something to build on now. "Most of our focus this week has been working on our defensive shape and structure, but we also broke into some good areas and, with a bit more composure, that could have have brought us something." Match ends, Wolverhampton Wanderers 0, Birmingham City 0. Second Half ends, Wolverhampton Wanderers 0, Birmingham City 0. Paul Caddis (Birmingham City) is shown the yellow card. Attempt blocked. Bakary Sako (Wolverhampton Wanderers) left footed shot from the left side of the box is blocked. Assisted by Lee Evans. Attempt missed. Bakary Sako (Wolverhampton Wanderers) left footed shot from the left side of the box is too high. Attempt saved. James Henry (Wolverhampton Wanderers) right footed shot from the right side of the box is saved in the bottom left corner. Assisted by Lee Evans. Attempt missed. Yannick Sagbo (Wolverhampton Wanderers) left footed shot from a difficult angle on the left is high and wide to the left. Assisted by James Henry with a cross. Wes Thomas (Birmingham City) is shown the yellow card for a bad foul. Foul by Wes Thomas (Birmingham City). Attempt saved. David Cotterill (Birmingham City) right footed shot from outside the box is saved in the top centre of the goal. Foul by Ethan Ebanks-Landell (Wolverhampton Wanderers). Wes Thomas (Birmingham City) wins a free kick on the right wing. Attempt missed. Dave Edwards (Wolverhampton Wanderers) header from the centre of the box is too high. Assisted by James Henry with a cross. Dave Edwards (Wolverhampton Wanderers) wins a free kick on the right wing. Foul by Brek Shea (Birmingham City). Attempt missed. Kevin McDonald (Wolverhampton Wanderers) right footed shot from outside the box is high and wide to the right. Assisted by Yannick Sagbo. Substitution, Wolverhampton Wanderers. Yannick Sagbo replaces Leon Clarke. Attempt missed. David Davis (Birmingham City) left footed shot from outside the box is too high. Assisted by Brek Shea. Attempt missed. Wes Thomas (Birmingham City) right footed shot from the left side of the six yard box misses to the right. Substitution, Birmingham City. Wes Thomas replaces Clayton Donaldson. Corner, Birmingham City. Conceded by Tommy Rowe. Leon Clarke (Wolverhampton Wanderers) is shown the yellow card. Attempt missed. Bakary Sako (Wolverhampton Wanderers) left footed shot from the left side of the box is close, but misses to the right. Assisted by Kevin McDonald. Dave Edwards (Wolverhampton Wanderers) hits the bar with a left footed shot from the left side of the box. Assisted by Leon Clarke. Attempt missed. Lee Evans (Wolverhampton Wanderers) right footed shot from outside the box misses to the left. Attempt blocked. Lee Evans (Wolverhampton Wanderers) right footed shot from outside the box is blocked. Assisted by Dave Edwards. Attempt missed. Leon Clarke (Wolverhampton Wanderers) header from the centre of the box is close, but misses the top right corner. Assisted by James Henry with a cross. Foul by Leon Clarke (Wolverhampton Wanderers). Corner, Wolverhampton Wanderers. Conceded by Darren Randolph. Attempt saved. Dave Edwards (Wolverhampton Wanderers) header from the centre of the box is saved in the top centre of the goal. Substitution, Birmingham City. Callum Reilly replaces Andrew Shinnie. Foul by Danny Batth (Wolverhampton Wanderers). Clayton Donaldson (Birmingham City) wins a free kick in the attacking half. Attempt missed. Kevin McDonald (Wolverhampton Wanderers) right footed shot from outside the box is close, but misses to the left following a set piece situation. Substitution, Birmingham City. Brek Shea replaces Koby Arthur. James Henry (Wolverhampton Wanderers) wins a free kick on the right wing. Foul by Jonathan Grounds (Birmingham City). Attempt blocked. Dave Edwards (Wolverhampton Wanderers) left footed shot from the centre of the box is blocked. Assisted by James Henry.